Can you use an abrasive cleaner on a kitchen countertop? What ingredients cause glass cleaner to work so well? This guide takes you through the ins and outs of all your favorite cleaners so that you'll know what you can and cannot clean with everyday cleaning products. Ingredients called "active" are the main components of any product. Here are some common household cleaning products along with their active ingredients. Ammonia: While you may think that the main ingredient in ammonia is, well, ammonia, this isn't exactly true. In fact, ammonia is a compound of nitrogen and hydrogen. Bleach: There are essentially two kinds of bleach. The bleach that you may clean certain parts of your home with contains sodium hypochlorite. Bleach powder that is used to brighten your white laundry often contains calcium hypochlorite. Abrasives: This is a broad category encompassing many different products. In most instances, the main ingredients in abrasive cleaners include sodium dichloros-triazinetrione dehydrate, triclosan, and silica. Vinegar: Vinegar is composed of fermented ethanol, which produces acetic acid. Thus, the active ingredient in vinegar is acetic acid. Glass cleaner: Most glass-cleaning products contain ammonia, among other ingredients. Some glass cleaners contain 2-butoxyethanol and other chemicals, though manufacturers tend to keep those components a secret. Now that you know what the active ingredients are in your favorite cleaning products, there are just a few more things to be aware of. Some of these should only be used on certain surfaces, while others are relatively versatile. Always read the label instructions first, and avoid combining 2 or more cleaning products. Ammonia is suitable for a number of different cleaning tasks. The one place that ammonia should not be used is on upholstery or carpeting. Even though some people believe that ammonia will lift upholstery and carpet stains, this product may also remove the fabric color. Bleach is another versatile product that can be used to clean a number of different surfaces. Be careful when using bleach to clean wood, though, as it can cause damage. Abrasives were created to slough away tough stains, which is why these products are great for bathrooms and kitchen sinks. However, using an abrasive on a countertop is never a good idea, since these products can damage the surface. Vinegar is a relatively mild cleaner that can be used on most surfaces, from floors to walls. Do not use vinegar on upholstery without testing the product on small area first. And never try to clean stone surfaces with vinegar, because it will etch. Window cleaner can be used to clean windowpanes and any stainless steel surface. Avoid using it on plasma TV or computer screen; instead, wipe gently with a dry microfiber cloth. The important thing to remember when using any cleaning solution: Do not mix products. While you may think that combining two cleansers will create the ultimate cleaning solution, this can also cause a dangerous chemical reaction. Instead, stick with one product for one surface in order to avoid a chemical disaster. 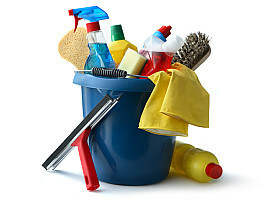 To get your house sparkling clean, hire a reliable professional house cleaner.